“Louis is one of the rare ones. A wise, smart, empathic and intuitive coach, teacher and leader, he is also a pioneer in the realm of bridging our heads with our hearts, combining our deepest longings for happiness and connection with the real world work of inspired action and tangible success." “Therapy is not something I, or any of my family had ever considered. And had it not been for the appalling circumstances we found ourselves in, we would never have taken it on. With Louis we couldn’t have been in safer hands. During our sessions with him, he very cleverly, patiently, and in a lighthearted way made it really easy for our 9 year old son to engage and express some quite unsettling feelings very freely. He helped us as a family question our weaknesses and reflect upon our strengths, gently and brilliantly steering us out of a moment of crisis. We finished our time with Louis a much stronger, happier unit of three. Having found strengths in ourselves, and each other that we hadn’t known existed before. As our son described it: ‘You walk into an understated room and think why? And then he really, really helps you’. He makes you feel happy… listens to all your points of view’...’He’s kind and caring’…’ He’s helped me in more ways than you can imagine’. "Dear Louis, Just wanted you to know that since we stopped the sessions our son has gone from strength to strength. He's back to being our bright eyed, singing all the time son, and seems very settled and happy. I've heard your wisdom on many occasions - sometimes from our son to his peers, sometimes our son to himself as he gets a handle on confusing or upsetting situations. And sometimes to me from our son - quite something really. Thank you so much." "I'd hate to think where I would be right now if Louis hadn't been in my life. He has this intuitive sense of when something isn't right - and he approaches each situation with care and concern. Even when I had made some questionable decisions, he'd advise me without judgement and was the voice of reason I needed when I couldn't find reason in myself. He would often go to extra lengths to help me even though he totally didn't have to, just out of the goodness in his heart. Not only does Louis have an intuitive sense of when something's wrong, he has an even better sense of how to fix it. I feel so lucky I was taught by Louis for two years, Monday's at 5 o'clock often felt like I was seeing a friend, not a therapist, a very patient, emotionally-intelligent friend. Thank you Louis!" ”Louis was my son's therapist for 2 years and from the get go, he had my boys undivided attention. As a single mum it can be very hard to find good, strong, cool, relevant role models easily who have such a therapeutic benefit... Louis was invaluable to us. My son's behaviour improved so dramatically at home it was astonishing and even though he still has a difficult relationship with his father he is able to deal with it with so much equanimity and resilience that would not have been possible without Louis almost divine intervention! He treated me with the utmost respect and that made a huge impression on my boy. I will be forever grateful to him for what he did for us, he was there for the worst period in our lives and helped my son to get through it and even after their time was up he wrote a letter for me that saved our home situation and made it impossible for the council to make us homeless. With Louis on your team, even for a short while, you can win the game of life! There is a proverb which says: "He who saves one life, saves the world." Thank you Louis, for saving my son. You will never be forgotten and will always occupy a place in our hearts and minds!!" Sorry I haven't spoken to you in ages. “Louis really helped me out of a rut in my life. He wasn't patronising like other therapists I had seen before. He treated me with total respect and gave me the help I needed to get back on my feet." 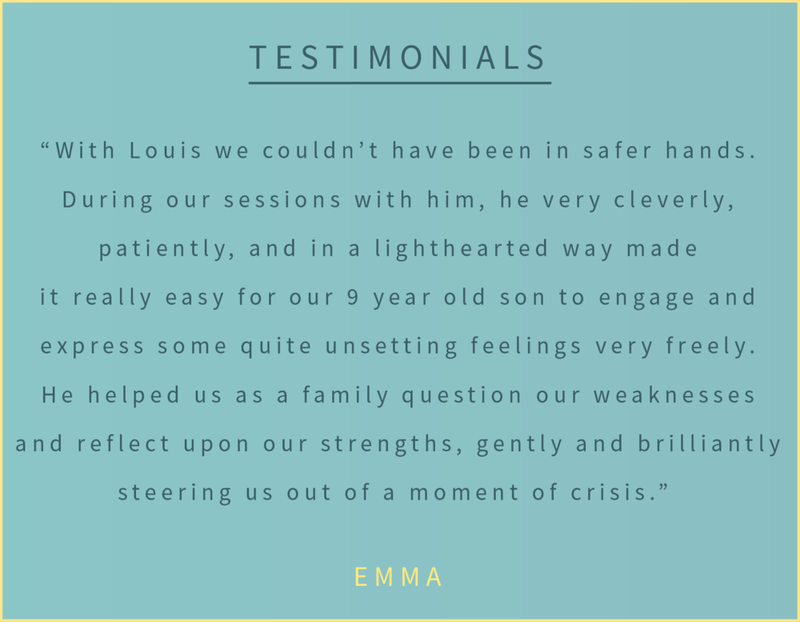 "My son had a melt-down, having regular, debilitating panic attacks which left him in a permanently anxious and depressed state... it was not until we found Louis that my son had a real breakthrough. During his first year of A levels my son had a melt down and ended up having regular and debilitating panic attacks which left him in a permanently anxious and depressed state and on the verge of dropping out of school. We took him to see several therapists and counsellors but it was not until we found Louis that my son had a real breakthrough. He felt very able to open up to Louis and was eager to take on board his ideas and strategies for managing the situation. I am very grateful to Louis for restoring my son's confidence and self esteem and ultimately enabling him to sit his A levels. Approachable, trustworthy, relaxed. These 3 words spring to mind when I think of Louis. 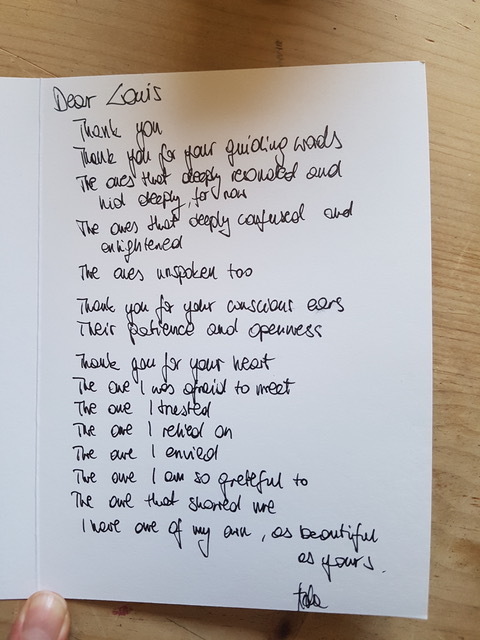 Louis was able to relate to my 15 year old son, to help create a safe place to share personal stories which helped to unlock feelings which needed exploring. 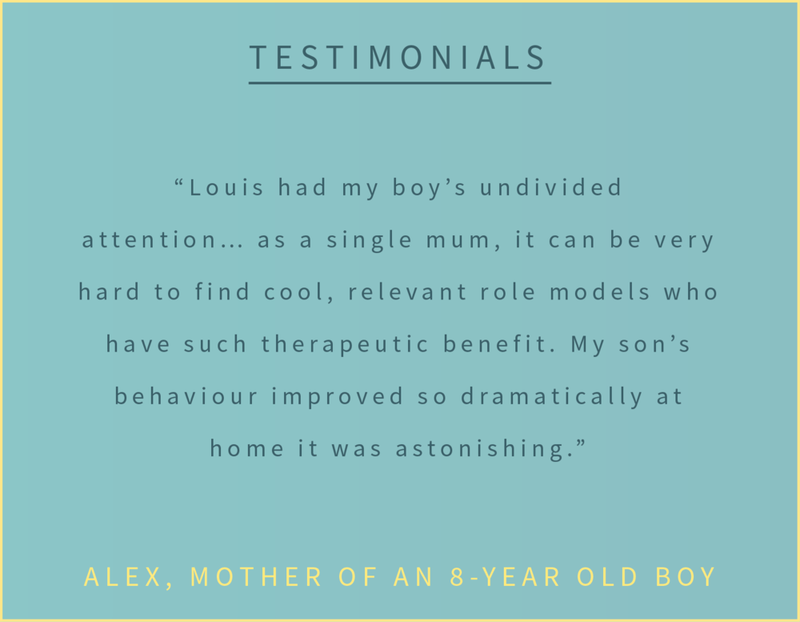 Louis was also able to relate to myself as a mum, to listen and be the go between when difficulties arose, I would strongly recommend Louis, if a therapist is needed. "Over the months I worked with Louis, I found that he was able to be an empathetic, compassionate and (crucially) non-judgemental listener, whilst also providing insightful reflections. It is clear that he not only cares a great deal about his work, but that he also puts a lot of himself into what he does. It appears to be much more than just a job for him, and this is reflected by the way he seems to be as invested in his own personal growth as in that of his client. Additionally, it is shown in the way that he sees change as not only needing to happen personally, on an individual level, but also (and perhaps more importantly) collectively, on a community level. He is open, human, compassionate and engaged. Thank you Louis!" "The course gave me the ability to take a step back emotionally when my children were being difficult to handle. I was given the tools to manage my own emotions which in turn translated into much better managing theirs. Everyone is more at peace. I am now also much better at not just being "mum" around my kids but trying to see who they are really are and making an effort to be myself as well. I find it much easier to give my kids space to be themselves instead of always mothering them. The course has been invaluable for me and I would recommend it to anyone who wants to get to know themselves a bit more and hence become a better parent." "Mindful Parenting training sessions with Louis have been an inspiration. His kindness and gentle guidance have helped me to step back and look at situations and indeed behaviour patterns from a different perspective. Louis has helped me to both navigate my way through the trickier parenting moments and appreciate the beautiful ones even more." "I just wanted to say thank you SO SO much for running such a wonderful course over the past few weeks. It was truly enlightening and really enjoyable. I think that we are all now so much better equipped to move forward on our mindful journey. My husband says that he has seen a marked change in me and that he is so glad that I joined your sessions- high praise indeed." "I am very thankful for having taken the 8 week course with Louis. It was a great reminder of how important it is to live in the present moment and to take care of yourself. Learning to practise mindfulness as a parent was extremely helpful. It helped turned situations that could have resulted into angry and frustrating experiences, into more relaxed, compassionate and loving experiences. Thank you Louis!"